When I went to my booking in appointment at 12 weeks I had a chat with the midwife about previous pregnancies and we discussed Miss B, her delivery, size and weight etc. She was 6lbs 12oz and very long and has stayed that way. I must admit I was really surprised when the midwife wanted to refer me to a consultant because she was worried I might be having a “tiny” baby, nobody ever told me that Miss B was under sized or concerning so it didn’t make any sense. A few weeks later I went to see the Consultant who was really bewildered as to why I had been referred because Miss Bs birth weight was perfectly normal. She was more than happy at her weight and my history but told me I could get a growth scan at the end of the pregnancy to put my mind at ease (I would like to point out that I wasn’t worried in the slightest)! Then skip to Week 29 where I was diagnosed with Gestational Diabetes which I blogged about here and the midwives were worried about me having a bigger baby. I had a scan three weeks ago and the baby was measuring on the 95th percentile and weighed approximately 5lbs 5oz which was large but not worryingly so. I got some advice from the medical professionals and the Diabetic Consultant decided to start me on Metaformin to help keep the baby on an even keel. The consultants are still really happy with my diet control but the tablets are just to maintain the size of the baby and to stop excessive growth. Last week I had a surprise trip to the day clinic when I wasn’t feeling as much movement as usual. I went up to the local hospital and the midwife asked me to wait while they were finishing with another patient and she would get me on the monitor. About 15 minutes later she came back and sent me through to the Sonographer who was finished for the day and decided to check me over. There was a very strong heartbeat and plenty of wriggling going on so she was happy but she took some measurements and said it looked as if the baby hadn’t grown for two weeks. The midwife then put me on a trace and the heartbeat and movement was all fine too so nothing to worry about. She then called the Consultant at my maternity hospital who asked to see me this week for a growth scan to see what was going on. 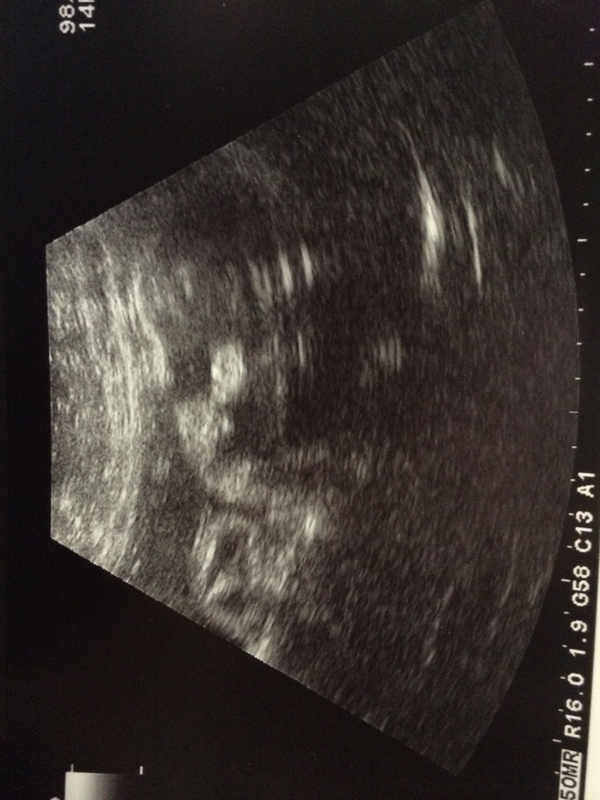 I went along yesterday and was scanned again, all measurements are good and the baby is approximately 6lbs 15oz. When they plotted it on the chart, he/she is still on the 95th percentile and where they would expect at this stage. The blood flow in the cord was perfect and the fluid around the baby is good and healthy so no worries there, the baby is definitely growing. The next stage is for me to keep controlling my diabetes with diet and the Metformin then I have another scan in a few weeks where we will review the scans and make a decision about whether to induce early or not, if they do it will only by one week so not the end of the world. Now we just have a waiting game, I have reduced the stress that I was suffering from thankfully and feel much happier with everything. I have pretty much everything organised and ready so now it’s time for feet up and spending some quality time with Miss B before our new, possible early arrival. There’s been a lot of information to take in over the last few weeks, and the midwives have gone from being concerned the baby is too small to now being too big. All I care about is that he/she arrives safely for both our sakes and I will do whatever I can to help that.